Disambiguation: This is not a typewriter that belonged to Schrödinger. But it might have been. It may have belonged to or not belong to Schrödinger simultaneously. Okay, this blog might hurt your brain a little. The cat is out of the bag. Or moreover, the box, and is now being looked after by Anna Strad. Cats are her thing, after all. So now we have Schrödinger’s cat out of the way, we have a box. A box with a typewriter now in it. A box… a very taped up box. Now, if you’re not familiar with Schrödinger’s cat, you’re probably already finding this blog confusing. The premise is a simple theoretical experiment in Quantum Mechanics that implies that a cat in a box potentially exposed to circumstances that are toxic to it, can be witnessed to be alive or dead independently simultaneously by different people, but a single individual will not see both. Sorry guys, that was just a really, really quick and dirty explanation which leaves a lot to be desired. Anyway, here the toxic circumstances are – the efforts of Australia post and Deutsche post to handle and transport this typewriter over the last 23 days to me. Being that Munk and Richard Polt have both received pulped typewriters lately, it is clear that posting these machines poses a fatal risk. I collected this machine from the local post office this afternoon. It feels light, and particularly well taped, but not padded. So, peeking into the box from the comfort of your chair… Is the typewriter alive, or dead? April 10, 2013 in box, Schrödinger, typewriter. ← My marvellous indulgence in Dr Blake. You had that Dry Martini before writing this post, didn't you? Back to topic, I'd say the typewriter is alive. If it's fastened down inside its case, then it 'should' be okay. You're gonna make us all wait, aren't ya? Oh, damn. I forgot to stop and get the ingredients. I'm going to have to stick with the on hand scotch instead. Oh no … the suspense is torture! You didn't mention rattling sounds, so I hope it will be OK. It's alive – fingers crossed. BTW – LOVED the set up, very clever. It's alive and dead all at once. The possibility also exists that it was dead before it entered the box, even if it was properly packed as if it had been alive. The Remingon Noiseless 8 I bought, some time ago, was preserved very well, but it had experienced fatal injuries at some point. Ever since, I've considered anything bought, sight unseen, with suspicion. 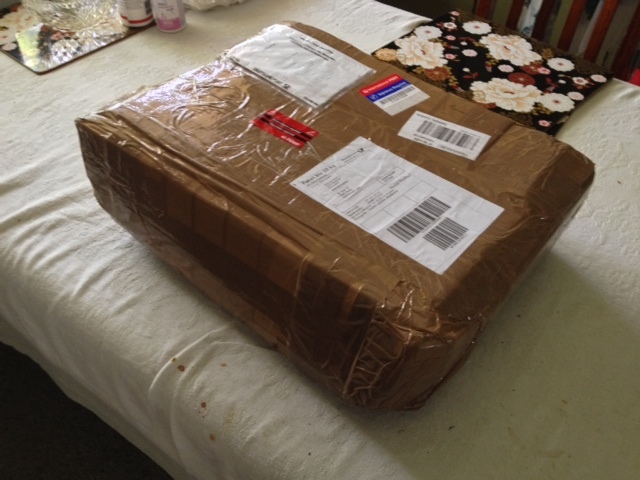 On the other hand, I had previously received typewriters in boxes that were as thoroughly wrapped in tape as that one. Perhaps your parcel contains the golden goodness which I've enjoyed. Let us all hope so. Nice reference! I saw the title and immediately knew what the post was about. But an answer? I don't have one. Yes, the box is taped thoroughly, it has no enormous dents in it, but that says nothing about the insides. It's indeed, Schrodinger's typewriter. How can you withhold yourself?! it doesn't have an apology taped to it so I'm holding out hope. It is alive in so much that it hopefully works. However, being that the typewriter is obsolete, it is dead in the technological sense! Well, clearly this package should only be opened by one of us who believes it is alive! I have GREAT faith! The machine will be in perfect running order though, if the case is rigid material like steel, aluminium or wood, there may be some stress fractures at the joints. Nothing serious though. PS: That rattling? That's just a spool come off. Or maybe a paperclip under the typebars. Well, sounds like some people I've worked with…. Oh man. A month! Where is it coming from? Fingers crossed that it isn't hangin' with the Titanic. Well, as you will see in my subsequent blog, this is very much the case. I have never seen an apology taped to a box. And some of the boxes I have had in the past have been absolutely mangled. Well! Breathing deeply helps. I actually just picked up the box, and headed to work. It is open now ( as you can see with the updated blog) but I organically wrote this blog while I was on a meal break! Obsolete is a relative term! The function that it performs is not obsolete, just the context it is performed in. Let's just say a tentative salvageable. Ha ha ha. Well, you'r superposition was sound. It is open now, and one of the realities have collapsed into the other. Weirdly, the rattling turned out to be folded paper sliding about inside the case. The sellers invoice, and a note telling me how to give feedback! The nerve…. You've posed an interesting question that can be taken to logical extremes. Could this be a test of faith? If you didn't have faith that the machine is one piece and you open the box and it is broken, is it because you lacked faith? But what if you had abiding faith that the machine would be perfect and it is broken? Could the typewriter gods have been testing your ability to remain faithful? What if the typewriter is just fine, but it is possessed by malevolent spirits? Well, that's certainly an interesting take on the situation. I believe that answer is “42”. But you're right. It can bear very much interpreted in many ways. Unless you're a Buddhist. Then, they typewriter is merely being re-incarnated into something else, after it is dead.